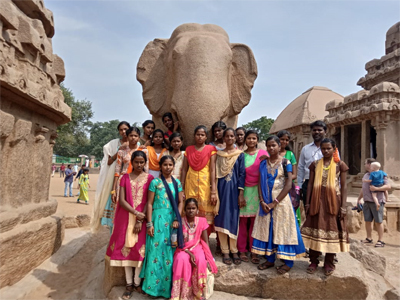 On January 19, 2019, SARVAM organized a trip for the English Access Microscholarship students. 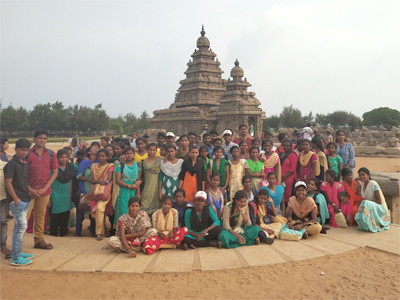 More than 100 children, both boys and girls, went for this excursion to understand the architectural and monumental greatness of the ancient Pallava Dynasty. It was a wonderful opportunity to educate the children about the historical, archaeological and spiritual magnificence of our country. The main intention of this trip was to familiarize the students with, and give them practical exposure to, some of the places of historic and spiritual interest about which they have read in their textbooks. 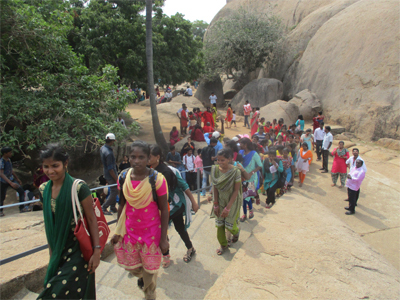 Before the commencement of the trip, the students were given a brief introduction about the significance of the alternate names Mahabalipuram and Mamallapuram; Mahabalipuram because the demon king Mahabali was killed by Lord Vishnu. The name was changed later by the king of Pallava Narashima Varman who had earned the title of Mamalla; the great wrestler or warrior. 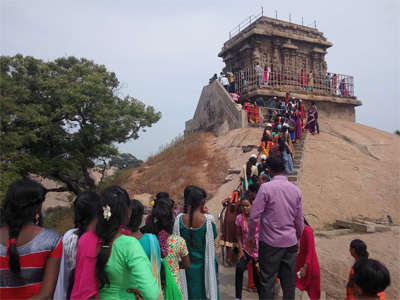 The students were informed and then they discovered for themselves that the influence of the rule of the great Pallava Dynasty from the 3rd century till the end of the 9th century AD. It is apparent from the beautiful rock caves that the Pallavas were the pioneers and forerunners of new styles both in art and architecture, and Mahabalipuram is the best showcase of their skill and talent. The monuments are a fusion of religion, culture and legend. They are expressions through rock or caves, on a grand scale, integrating nature and sculpture. They received a wonderful peak into the history of the area with this trip. The next stop on the trip was the Mahabalipuram lighthouse. Mahabalipuram was a busy port under the Pallavas as early as the 7th century AD. Bonfires were lit on rocks even at that time to aid the mariners. The British first used the temple atop the Mahishasuramardini cave as a lighthouse. The new lighthouse and the old lighthouse are adjacent to each other. The stop of the day was the Maritime Museum, next to the Lighthouse. This naval heritage museum provides history exhibits, a decommissioned submarine as well as different types of ships and materials used in the construction of ships from historical times. The trip was successful in more ways than expected. The students learned about the richness and beauty of ancient India through the monuments and other tourist spots they visited. It provided them a wonderful exposure to the political, archaeological, social, religious and aesthetic aspects of a great Indian dynasty. While they were absorbing all of these, they learned new words and terms, the importance of teamwork and having fun together and the wonderful aspect of discovering the world outside their little villages.